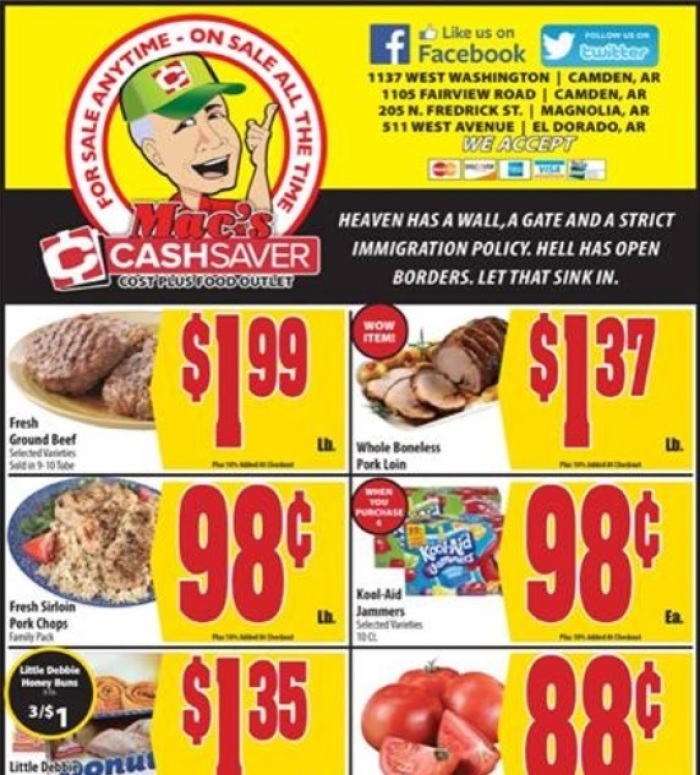 The Christian owner of a grocery store chain received a death threat in response to a message on his weekly ad mailer that featured a statement about Heaven, Hell and border walls. The mailer has garnered national headlines by media outlets that are drawing attention to the few who've voiced their objections to the ad's message. He raises a good point. Ask a liberal why they have doors and locks on their house. We all demand the right to decide who enters our homes. Don Draper would be proud. Leftists sure do seem to enjoy threatening people who don’t agree with them. That is excellent. I will use it. And I like the pork chops at 98 cents a pound. Good point and a pretty good sale, too! The Good News. Some people’s sole reason for living is to litigate against Christians and conservatives. If he has a few thousand available for representation, then go for it. Most Liberals cannot co-exist with other belief systems, regardless what they say. Pork is just so much cheaper than beef. It amazes me how much cheaper. Evangelism that’s worried about being inoffensive is not evangelism. If they don’t want walls on the border then they should remove walls and fences around their homes. In days gone by, people offended by this would just not spend money there. Today, nothing less than a death threat will suffice! Insane. $1.37 for whole pork tenderloin is a good price. true. got plenty of Scripture to back all of that up. Pigs are much easier and cheaper to raise. You don't really need pasture for pigs, they mature faster, eat whatever cheap crap you give them, and you'll get more meat/pound from a pig than you do from a cow. Also, for anything lost to disease/wild animals/etc, loss of a pig is much cheaper than loss of a cow. For baby animals, cows are about 4-5x more expensive than pigs.